I’ve pushed my German test back a bit, which will allow me to learn the language better, and also creates some cushion in my schedule now, which is greatly needed here at the end of an exhausting summer. I’ve said yes to too many book reviews and other projects, and I underestimated how busy the summer would be with our trips, staff and volunteer transition, and so on. So I am going to take the next few weeks until classes start on September 30th to really practice Sabbath rest and gear up for another year – year 2 of PhD coursework, and year 4 of my youth pastor job. Wow! Its flown by. I am excited about my fall class, Historiography. I will finally be getting into historical theology specifically, and getting more immersed into Fuller, whereas up to now its been more Independent Readings. Those have been fun but I think its time to really submit myself to the program now, and see where it takes me. I believe God has called me to do this degree in order to shape my thinking in certain ways, so I am excited to see how it will develop. I’m open. 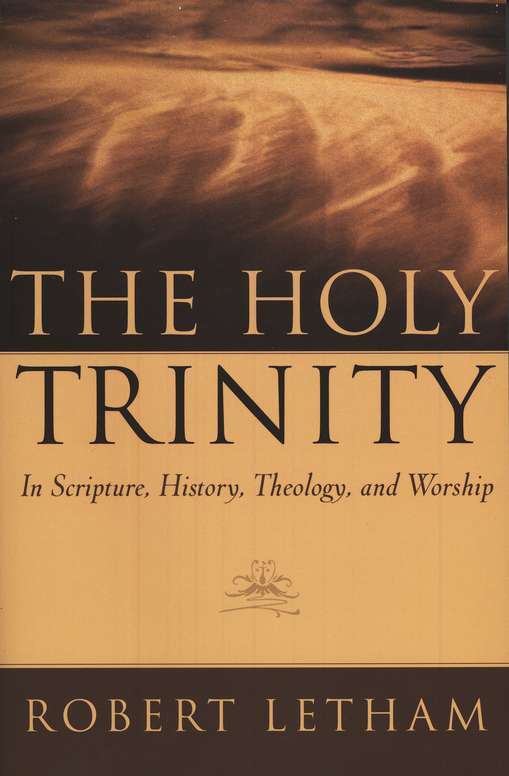 This morning I used my free time to leaf back through one of the best books I have ever read, Robert Letham’s The Holy Trinity (P&R 2004). It may be the best contemporary theological book I have ever read. It is thorough (500 pages), practical, insightful, grounded yet open-minded, and on a much neglected subject. Its the kind of book I could probably sit with for several years. I’ve written about it here. One of the thoughts its first chapter sparked is how the Trinity is in the Old Testament. Sometimes people say that the Trinity is not revealed in the New Testament, but I don’t agree. I would say the there is a murky, partial revelation of the Trinity in the Old Testament, such that if the Old Testament saints could have read the Athanasian Creed, they would have said, “ah, so that’s it! Everything makes sense now.” Here is a list of a few texts that I think, if not leading themselves all the way to the Trinity, only make sense in light of the Trinity. There are many others. I here pass over, for instance, Genesis 1:26-28, the identity of the “Angel of the Lord,” the personification of Wisdom in Proverbs 8:22ff., Abraham’s three visitors in Genesis 18, Daniel 7:14, Micah 5:2-5a, etc. But these are among the first I would turn to. I am sure this one really puzzled the Rabbis. Who is this figure, differentiated from YHWH, yet Lord over David and ruling the nations (vv. 2ff.)? Or as Jesus put in Mark 12:37, “David himself calls him Lord. So how is he his son?” But looking back from the New Testament after the ascension of Christ, this text makes perfect sense. …his name shall be called Wonderful Counselor, Mighty God, Everlasting Father, Prince of Peace. Most Jewish interpreters interpret this passage as referring to Hezekiah. Personally, I think “Everlasting Father” is already a stretch for Hezekiah, especially given what Hezekiah does in Isaiah 39. But when it comes to “mighty God,” it seems even more difficult to see this as referring to Hezekiah. But again, looking back from the Incarnation, what is blurry comes into sharp focus. The fact that this figure receives worship, and that the ground is holy because of him (recalling the Lord’s manifestation to Moses in Exodus 3) makes me think He is divine. Yet he is also referred to as “a man.” I suppose this could be a straight up theophany, but the title “commander of the army of the Lord” seems to differentiate this figure from the Lord. (Is YHWH commander of the army of YHWH?) I wonder if its best to see this figure as some kind of pre-incarnate manifestation of the Son of God (as I also wonder with the angel of the Lord throughout the Old Testament). Your throne, O God, is forever and ever. The scepter of your kingdom is a scepter of uprightness; you have loved righteousness and hated wickedness. Therefore God, your God, has anointed you with the oil of gladness beyond your companions. Simple question: if God is not Triune, who is God’s God? Its interesting that these texts don’t just refer to the existence of the Son of God, but to his incarnation (Isaiah 9:6), his death (Zechariah 12:10), and his ascension/session (Psalm 110:1). Of course, this doesn’t get you to the Trinity. But it does point to some kind of distinction within God, which really only makes sense in light of the Trinity. Or at least, it doesn’t not make sense within the boundaries of a unitarian monotheism, as with contemporary Judaism or Mormonism or Islam (all of which adhere to these texts, albeit Islam more loosely). I think you’re right about the Trinity being revealed in the OT – it’s especially telling that the NT authors quote some of these passages. For example, Hebrews 1 picks up on the dialogue happening in Psa. 110 and Psa. 45 as inter-Trinitarian dialogue.